Pepe Nero is one of Goose Island’s latest beers, and it is one I was initially intrigued about due to its use of black peppercorns in the brewing process. Labeled as a “Belgian Style Farmhouse Ale” by the brewery, this is certainly a unique beer unlikely any other that I have had. When poured into a glass, the beer has a dark color similar to a cola. Its spicy smell gives hints of what’s to come. It is hard to place all of the different tastes that come out of Pepe Nero. It is spicy, a tad sweet, and definitely roasty. The peppercorn is transparent at first, but it quickly takes over and leaves a lingering presence on the tongue. This is really a funky beer that has a lot going on at once. 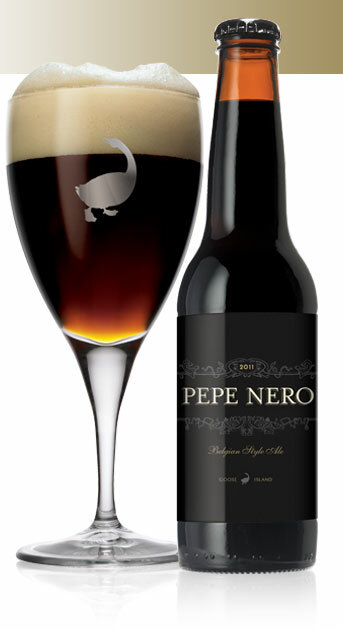 While certainly interesting and worth trying, I wouldn’t say Pepe Nero is one of Goose Island’s best offerings. The peppercorn gives it a nice kick, but it doesn’t propel the beer to the next level of quality. If you like peppery tastes and are willing to give an experiment like this a try, it might be in your best interest to pick up a bomber of this. Pepe Nero is good, and I am glad I tried it, but I will likely pass on it in the future in lieu of some of the brewery’s more superior brews.